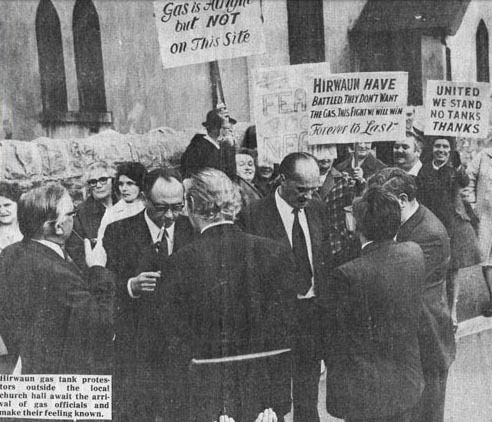 The Aberdare Leader first broke the news of the proposed gas plant development at Hirwaun in November 1970. In granting the Gas Council’s application for the construction of a gas liquefaction and storage installation plant on land adjoining the Rhigos Road, Hirwaun, the Secretary of State for Wales, Mr. Peter Thomas, reviewing the reports by his inspector, Mr. 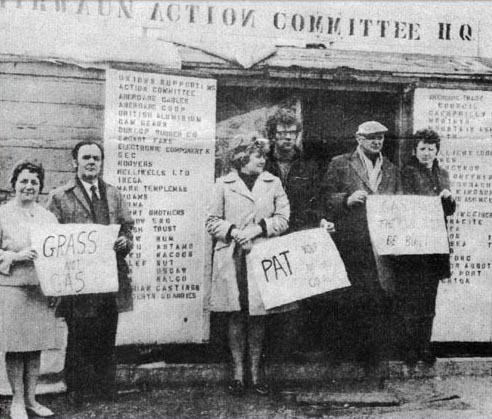 I. Wyn Pugh and Dr. G. J. Jeacocks, the assessor, concludes “ On the information available I have no reason to question the general conclusion of the Gas Council, and of the Aberdare District Council, that other than the Wales Gas Board land at Llandarcy, the application site at Hirwaun appears to be the only acceptable site available for the project. Hirwaun gas tank protestors outside the local church hall await the arrival of gas officials and make their feelings known. The alternative, a trunk main from Llandarcy would be too expensive, costing £1,000,000. He adds that the site on which the Gas Council hope to build the storage tanks extends to about sixty acres of semi-derelict very rough grazing land sloping gently upwards from the road towards the now derelict land of the Tower Colliery. The nearest individual dwelling is about 150 yards away to the north east with the more compact residential development of Hirwaun about a quarter of a mile away in the same direction. In considering the impact the installation would have on the Hirwaun locality, the Welsh Office Inspector is of the opinion that there is much to commend the siting of the ‘massive’ storage tanks against the background of the imposing Rhigos mountain, providing that the installation generally and the tanks in particular were colour camouflaged to merge into the background. He accepts that even so, because of the topographic characteristics, the site would be prominently situated in relation to Hirwaun village and the Heads of the Valley Road adjoining the site that at close distance the storage tanks would appear dominant and formidable in the local scene although the Glynneath by-pass and associated works would constitute a permanent substantial barrier of road and traffic between the site, fairly effectively segregating the two developments. He suggested too that the banks should be transferred to the western side of the site, 300 yards further away from residential properties, and that the tanks should be founded at bed rock level to help reduce the obtrusiveness of the installation. Contouring landscaping and tree planting would help to make the installation more acceptable in the locality. A trunk main from Llandarcy would be possible but it would be too costly. The Inspector concludes that an expenditure in the order of £100 million would hardly be justified at this stage simply to avoid the development at Hirwaun. Expressing the opinion that the installations would not deter industrialists from coming to the area or prejudice the expansion of Hirwaun, the Inspector adds: In this respect I must note that neither the management of the Industrial Estate nor any existing industrial interests on the Estate have opposed the siting of the tanks. There was no reason why on safety grounds the tanks should not be located on the Hirwaun site. The fears of the local community were understandable, but this was due in part to lack of knowledge and understanding of the technology of the proposed installation. The Inspector then proceeded to envisage that the Gas Council would want additional storage tanks on the site in the future. He suggested that there should be no extension eastwards in the direction towards the village of Hirwaun. The Secretary of State for Wales, Mr. Peter Thomas, accepting his Inspector’s findings emphasises that there can be no reasonable objection on the score of possible nuisance from noise of emissions. Members of the Hirwaun Action Committee huddle around a small heater for warmth during December 1973. The makeshift HQ at the site entrance was decorated for Christmas – but there was very little festive cheer that year. The Secretary of State adds: I have concerned myself particularly with the evidence on the possibility of hazard to life and property, but in the light of the report from the Assessor, which is endorsed by the Inspector, I feel that the fears on this account, understandable though they may be, are exaggerated and there is no reason as far as the issue of safety is concerned why the installations should not be erected at Hirwaun (the detailed layout and the precautions will be subject to a licence under the Petroleum Act 1928). Careful and sensitive treatment in the planning stage, appropriate contouring and tree planting, the visual effect of the development will not be unduly intrusive. 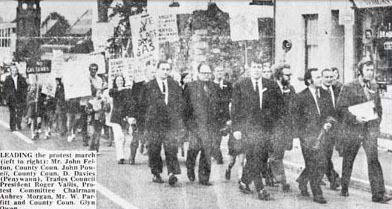 Under the provisions of Section 245 of the Town and Country Planning Act, 1971, a person who is aggrieved by a decision such as the one made with regard to the Hirwaun Gas Tanks may challenge its validity by an application made to the High Court within six weeks from the date when the decision was given. The grounds upon which an application may be made to the Court are that the decision is not within the powers of the Act (that is the Secretary of State has exceeded his powers): or that any relevant requirement have not been complied with and the applicant’s interests have been substantially predjudiced by failure to comply. 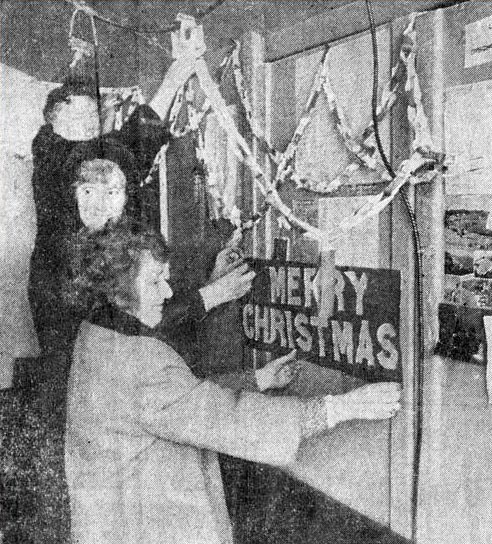 Members of the action committee put up their decorations. However, the right to make an application as a ‘person aggrieved’ is limited to the applicant and persons whose LEGAL rights have been infringed. The local authority who are directly concerned with the case are given a similar right of appeal. A person who thinks he may have grounds for challenging the decision should seek legal advise before taking any action. Inside the hall at Hirwaun, protestors and gas officials and mediators prepare for the confrontation. Campaigners were preparing for the winter siege at the railway wagon HQ. Tins of dried milk, bags of tea, plastic cups and tins of biscuits were piled high on improvised shelves inside. The workers at nearby Tower Colliery No 4 added their support to the campaign. 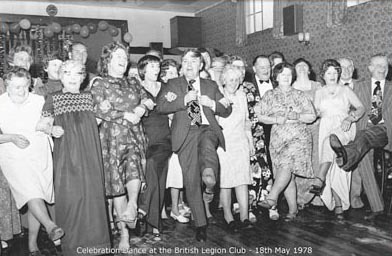 Celebration Dance at the British Legion Club – 18th May 1978. 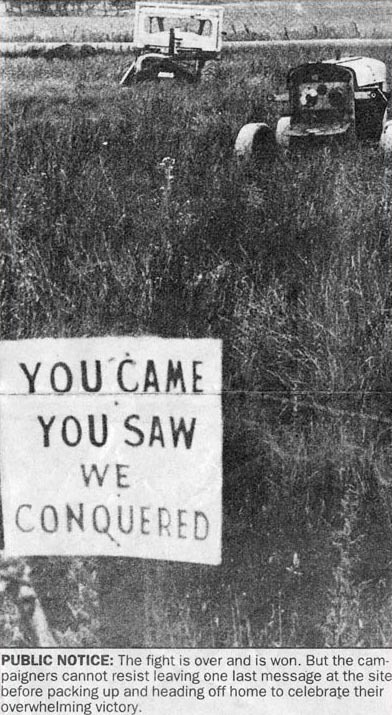 Last message from Gas Tank protestors after their victory.